I’m a yo-yo when it come to clutter. There are times when I’m a pack rat, obsessively keeping and filing away things in the hope that one day, it might be useful. Other times, I make a 360 and ruthlessly throw away things that I know I’ll never use again. Periodically, I read and marvel at Felix’s Simplify My Life posts. Lately, I’ve been pouring through the great tips and articles on Unclutterer. What more impetus did I need for the pendulum to swing? For the past two days, I’ve been decluttering the home office. Since we moved into the new place, the bookcase had become a disorganized mess of empty boxes, CD cases, loose paper, and knickknacks. My document bins were filled with opened envelopes, ads, and other things I’ll never read. It’s amazing how much crap can just accumulate in such a short amount of time; before you know it, your bookcase and filing cabinets have turned into clutter monsters! Yesterday, I started with the bookcase. Obsolete software like Final Cut 3, iWork ’05, and Baldur’s Gate went into a “Computer” box. The original packaging for some of my camera gear went into a “Photography” box. I reserved yet another box to hold all of my Newton paraphernalia except for my 10-year old Newton MessagePad 2100. Though it’s sad to see all of my Newton gear packed up, you have to say — or at least start saying — goodbye one of these days. 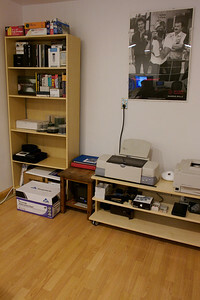 I spent a long time organizing my software collection, placing CD/DVDs into either a Case Logic binder or spool case. I then removed the labels and packaging from the CD cases, which will be reused in the future. Next, I organized my books in descending height order; there are a few books, however, that are no longer relevant and will soon be destined for the garage or public library –nothing makes a technical book more obsolete more quickly than purchasing it! The bookcase was also home to dozens of DV tapes, covering events such as one of Vienna Teng’s early East Coast Tours, my wedding, parties at the house, and various film projects. Those tapes are now organized logically in a perfectly fitting box. But wait, there’s still more! Envelopes, printer paper, and mailing supplies were collected at the top and bottom of the bookcase. I threw out tons of my old business cards from my previous companies, keeping about thirty of each for nostalgia’s sake. I do need to make new business cards for myself and Rae, but that’s a topic for another day. The shelves underneath my printers, which held my frequently used computer and camera gear — batteries, chargers, and hard drives. — was in sore need of reorganizing as well. Finally, after dealing with the bookcase, I turned my attention to the cable swamp underneath my desk. I used a four-foot long plastic corrugated wire loom (that I got from Eric when I bought his plasma tv) to stuff as many cables as would fit. I still need to get a few more wire looms to finish the job, but the space looks much more orderly now. The next day, I focused my efforts on my document bins. Into the recycling pile went envelopes from banks and utilities. Envelopes from the days when people sent in money through the mail for my software also went in the pile. One of these days, I’ll borrow or purchase a document scanner like the Fujitsu ScanSnap to handle bulk scanning. The flatbed scanner we have current takes too long to be efficient. After several hours, I cut the space used by my documents in half. 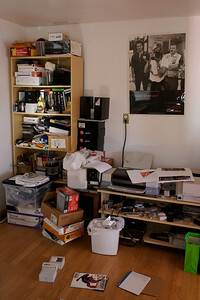 Let’s hope in the future, I’ll be able to better manage the clutter. For now, having an uncluttered office makes me feel better and more productive. For me, out of sight and organized means out of mind. Your before and after photos are impressive, Adam! Keep up the good work! Hi Adam, This is Jerry from Unclutterer.com. Just wanted to let you know that yours is one of the first blogs I remember following, so I’m happy to see Unclutterer has been useful to you. Take care! I do trust all the ideas you have presented for your post. They’re really convincing and will definitely work. Nonetheless, the posts are very brief for novices. May just you please extend them a little from next time? Thanks for the post.